Margot Potter for Avalon Potter! Avalon is on Spring Break and alas she caught a cold. 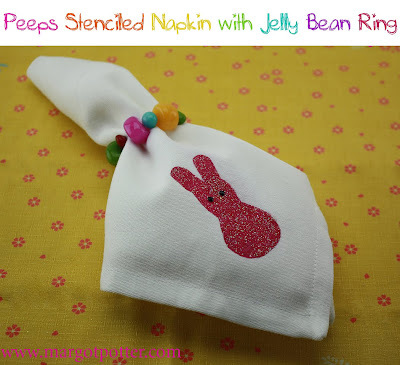 I stepped in to make this easy peasy stenciled napkin and beaded ring. I used cardboard to make the stencil, but it's very important to wipe off the excess seepage under the stencil between each use on all four corners. If you can find 'freezer paper' it makes a much cleaner and easier to use stencil. We LOVE Peeps around here, this is my third Peeps themed Easter craft! I had to buy a few boxes for research purposes, but keeping them from being devoured was quite a feat! Step away from the Peeps. 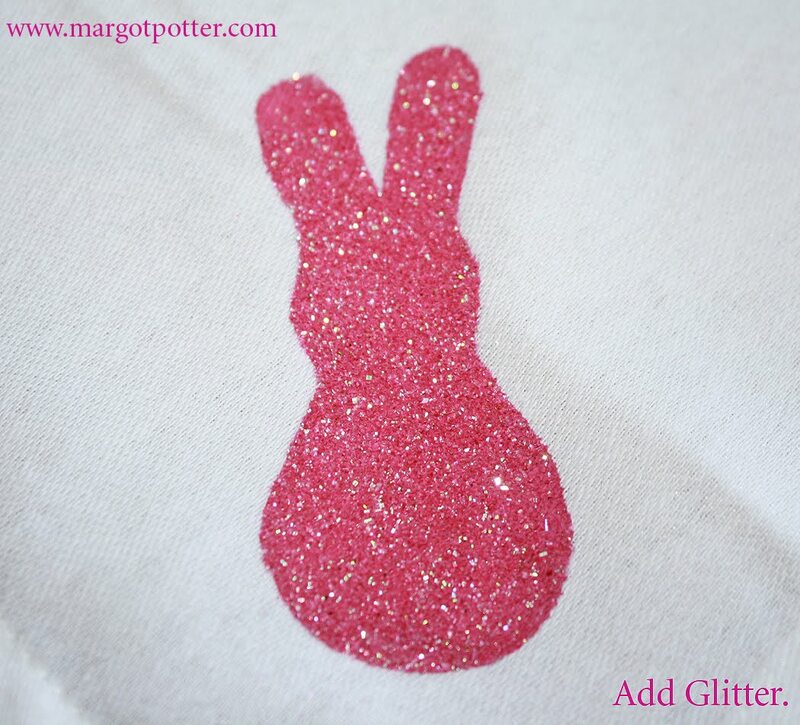 Tulip Soft fabric paints and Crafty Chica glitter make quick and easy work of this design and the Glam-it-up metallic crystals are perfection for eyes. Use Aleene's Jewelry Glue to secure the knot on your napkin rings. This is a great way to get teens off of their cell phones and doing something fun. 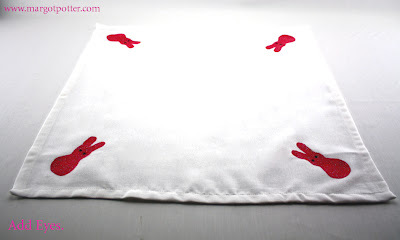 Make some coordinating place mats and you'll have a delightfully cheerful Easter table. Wash napkins to remove sizing. Iron to remove wrinkles. I freehand drew the rabbit, it's very simple. He should be about 2-3" tall. You want him to fit the corner of your napkin. If you need a guide, try using an actual Peep for reference, this also allows you a snack while waiting for the paint to dry. Use a craft knife to carefully cut the shape out and create a stencil. 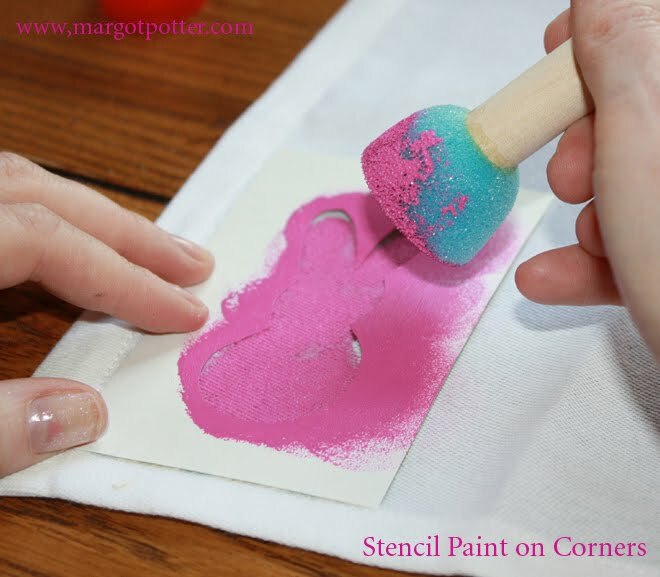 Use pink paint and paint pouncer to stencil on napkin corner. You can also opt to add rabbits along the shorter edge of your napkin, that's up to you. Hold your pouncer straight and hold stencil firmly to prevent paint bleed. Be sure to wipe off stencil front and back after each use. Before rabbits are dry, pour a small amount of glitter on each rabbit, shake around for full coverage and shake off excess. Do them one at a time! The paint should be tacky enough to grab the glitter. Add eyes using Glam it Up crystals, I use a pair of chain nose pliers to pick up crystal, dip in glue and attach to rabbits. 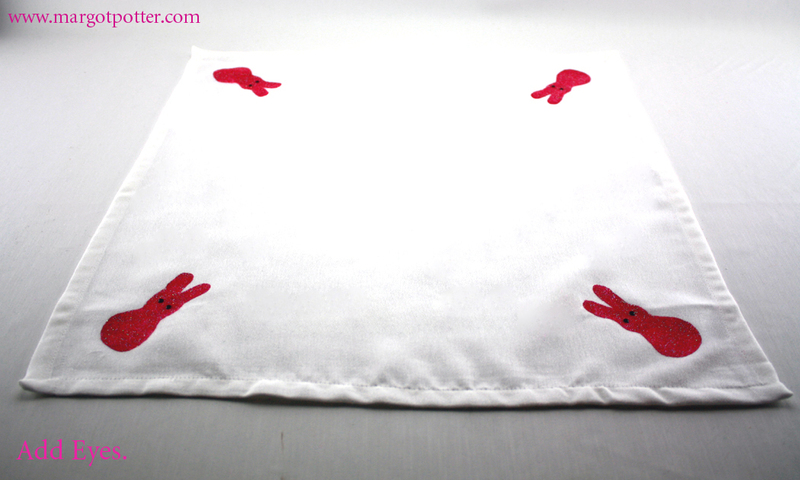 Allow rabbits to dry before using! Thread beads on elastic cord. Tie ends and pull tightly. Make a double overhand knot and pull tightly. 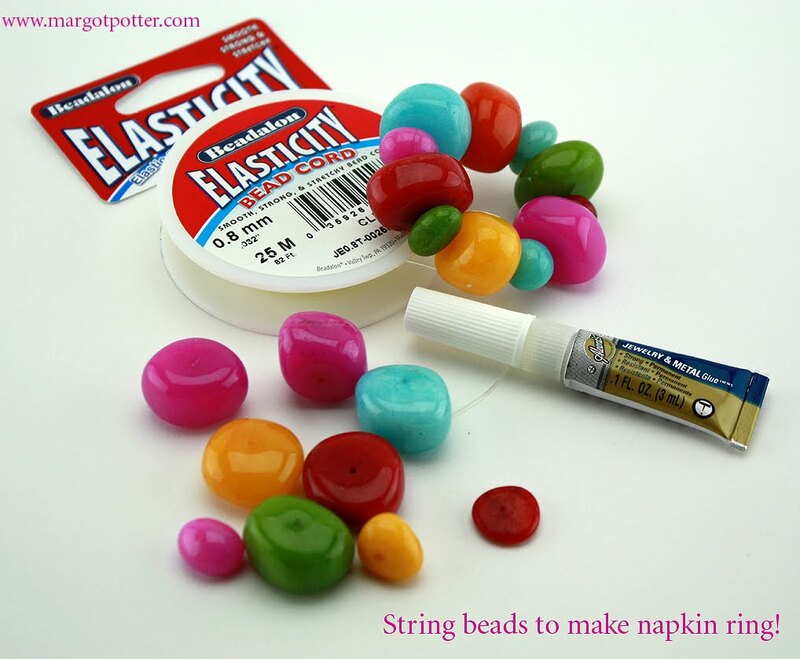 Add a dab of jewelry glue to your knot and let it dry overnight.